Recorded under the pier again. You hear voices and air brakes from rides at Adventure Island, voices under the pier, and the train arriving. The original recording has been cut down to make the weight; it’s not “real” in that regard: as well as trimming start and finish it’s also been chopped and channeled. 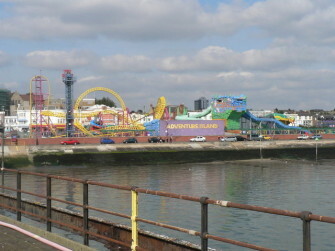 Photograph of Adventure Island used under Creative Commons (Attribution-ShareAlike) licence. View the original here.